Optimum Nutrition AmiN.O. Energy Review – Should you take it? One thing you learn when shopping for muscle building supplements is that almost all products include amino acids in their formula. After all, amino acids are extremely important in muscle protein synthesis. Supplement companies have all bought into the idea of making new amino acid supplements by combining them with different ingredients. One product that was a result of an unusual ingredient combination is Optimum Nutrition’s AmiN.O. Energy. Optimum Nutrition AmiN.O. Energy is basically a combination of different micronized amino acids and stimulants. As a result, it’s like a hybrid supplement that can be taken as a pre-workout supplement, or a support supplement that can be taken any time during the day. In this review, we’ll dig deep into the specifics of Optimum Nutrition AmiN.O. Energy to determine if the hybrid nature of the product pays off. Optimum Nutrition AmiN.O. Energy contains 160mg of caffeine. It’s important to identify which products contain caffeine, because there are dozens of other products that contain caffeine as its primary stimulant. 160mg of caffeine is roughly equivalent to 3 cups of coffee taken all at once. Take caution when stacking Optimum Nutrition AmiN.O. Energy with other supplements, especially pre-workout and fat-burning supplements. Who uses Optimum Nutrition AmiN.O. Energy ? Since Optimum Nutrition AmiN.O. 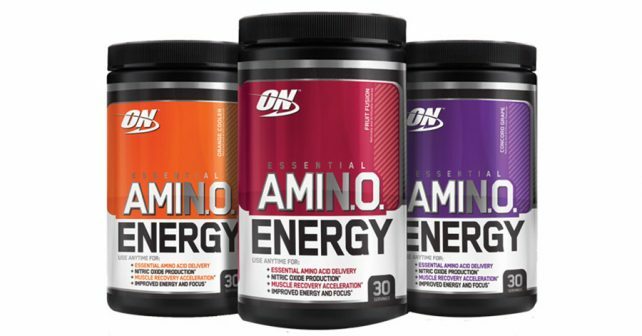 Energy is in a category of its own, we’re taking a guess that the people who use Optimum Nutrition AmiN.O. Energy would be those who are simply looking for an all-in-one product which you can take pre-workout for energy, and post-workout for recovery. Just like many other supplements, its composition is hidden away in a proprietary blend. According to its supplement profile, it contains 5 grams of various micronized amino acids, which include. L-Arginine, CarnoSyn, Citrulline, Tyrosine, and many more. It would be difficult to assess the effectiveness of the product, since it’s important to factor the amount of the individual amino acids per serving. What we can share is that it has ingredients that can improve blood flow (L-arginine, citrulline), improve muscle endurance (Carnosyn) and improve overall mood (tyrosine). Optimum Nutrition AmiN.O. Energy is priced at $19.99 per 30 servings, which can last anywhere between 6-30 days depending on how much you take. 1-3 servings per day can be used for pre-workout use, and 1-2 servings as post-workout use. You can take up to 5 servings a day based on your needs. Optimum Nutrition AmiN.O. Energy is a blend that simply doesn’t make sense. There’s a reason why pre-workouts and post-workout supplements do not have the same ingredients. Taking Optimum Nutrition AmiN.O. Energy pre-workouts can be effective, but only because of its caffeine content. Take it as a post-workout supplement and you still get the same caffeine content that was meant for its pre-workout application. If you’re looking for the best muscle building supplement, check out NitroGenix 365 – the best nitric oxide booster on the market today.